The AppExchange is a website for locating, purchasing (if a fee is associated), and installing 3rd party software into your Salesforce organization to extend its core functionality. There are hundreds of AppExchange packages available â€“ everything from expanding marketing capabilities to database integration packages. Check out the full list here. In addition, there are several great free AppExchange packages worth discovering, including one Iâ€™ve had great use for: Inline Account Hierarchy. All Force.com Labs packages are free (183 packages at time of writing) and can be viewed by clicking the publisher tab on the above link. Click this link to view free apps by all publishers. Unmanaged packages on the other hand are not locked and cannot be upgraded by the publisher. Find the package on AppExchange and install it. This will list the requirements for the package and require a system administratorâ€™s credentials. Find the package on the AppExchange and click on â€œGet It Nowâ€. Provide administrator user credentials to your org. Gives no custom object permissions to any user profile except the administratorâ€™s and any profile with the "Customize Application" permission. This option also sets field-level security to visible and editable for all fields included in the new the features in this package. After installation, if you have Enterprise, Unlimited, or Developer Edition, you can give the appropriate user permissions to your user profiles as needed. Gives full access to custom objects included in the new package. Additionally, sets field-level security to visible and editable for all fields included in the new package. 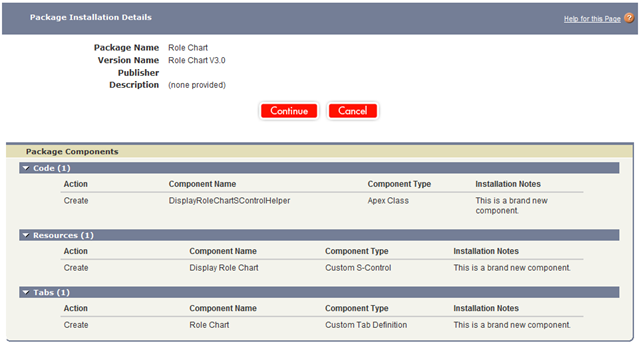 Allows you to choose the usage access for all existing custom and standard profiles in your organization. You can set each profile to have full access or no access for the new package and all its components. Setup â€“> View installed packages. Select the package and then click uninstall. You can view currently installed packages and package status at this spot as well. You will get an email when the package removal is complete.